The prospect of exploration is a powerful thing: making known previously unknowns brings with it both the excitement of the idea of having been somewhere few others have and the trepidation of thoughts of why others haven’t been where you’re going. 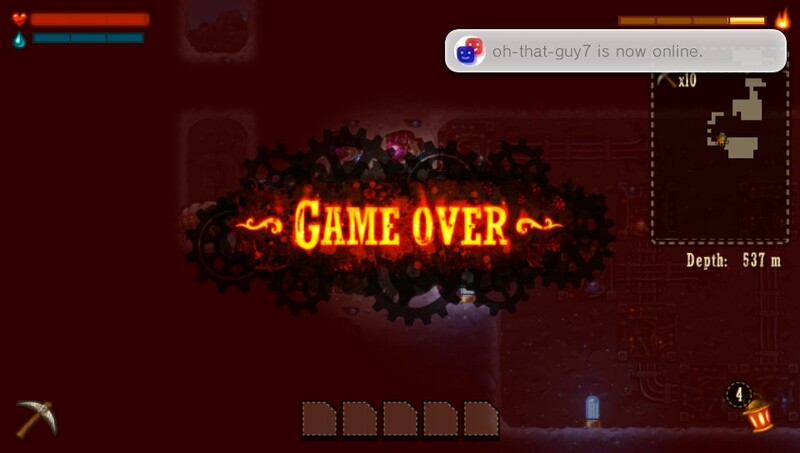 Though the latter may often be the product of an overactive imagination in the context of our world which has been, for the most part, explored and exploited to an extensive degree, Steamworld Dig‘s core hook lies in the ignorance of the player as to the nature of the game’s world, and indeed the ignorance of the game supporting cast as to the mineshaft that the player digs through. This sense of the unknown is bolstered by the fact that traversal down the mineshaft is a matter of player choice: while it would be unfair to say that the levels of game weren’t “designed” – item placement is, of course, indicative of design and the puzzle levels that can be found within the core mineshaft are delicately designed to wonderful effect – the downward path of the player is determined by the squares of material that they decide to dig through, a design choice evocative of Boulder Dash applied to the genre of games that themselves more than evoke Metroid and certain entries in the Castlevania series. Indeed, the concept of exploring a hostile world and acquiring new abilities for the player character through this exploration. which may themselves make previously impassable terrain passable once again, is made all the more compelling in this instance where the general direction of travel is downwards through player created paths: sometimes the only way to climb back to a point of egress from the mine is to descend further to find a new ability if one’s path creation is reckless. While one can always opt to self-destruct to return to the surface, this would involve a loss of currently held minerals, the core currency of the game – recoverable on a subsequent descent into the mine – and a loss of a percentage cash-on-hand, funds that will be lost forever. Aside from the traditional power-ups hidden in puzzle rooms within the mineshaft, there’s the option to exchange the cash and orbs (a secondary currency found from certain mineral squares in the map) earned from mining for upgrades to one’s pickaxe and other mining equipment, as well as the standard health and fuel upgrades. The conceit of water being the fuel for the player’s mechanised tools, given the explicit premise that all characters in the game are steam-powered robots, is a wonderful one that serves to tie up the visual, aural and kinetic aesthetic of the game. This idea of aesthetic wholeness permeates the entirety of the game: this idea of “untouchedness”, that the mineshaft that the player descends has been untouched for aeons, is realised further by the trilobite-like enemies being encased within unmined blocks, only to be reawoken by the player’s actions and the changes to the type of the enemies that the player will faces as they descend further into the shaft, each core “area” embodying a temporal delineation in the formation of the shaft’s sediment. You’re likely to see this a few times. 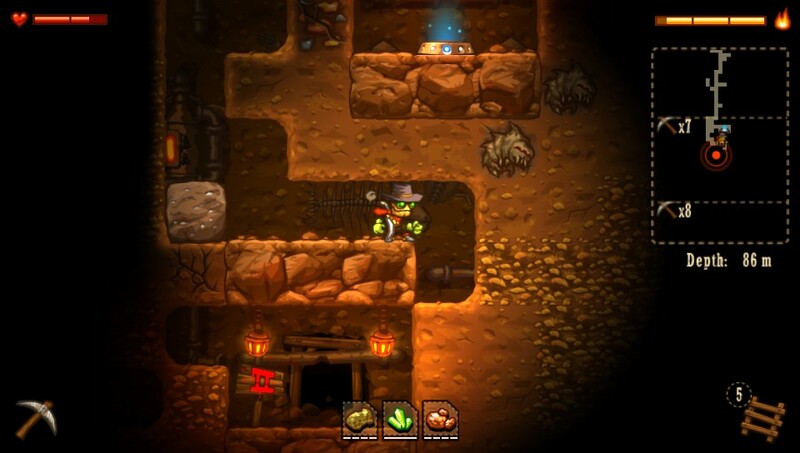 Steamworld Dig is a wonderfully constructed game in its genre: the nature of the player’s involvement with the environment captures more than most the idea of exploration, giving the player a near-blank canvas upon which to make one’s own mark and define one’s own traversal through a hostile environment. You can choose to fight or avoid skirmishes; to pursue a given item’s upgrade path or not; to brave further down the shaft or return to the surface: there’s not wrong way to play the game, and what’s left is a wonderful sandbox for one to dig around in at leisure.